As these generations make up a greater percentage of the workforce, employers will need to re-evaluate their health and employee benefits offerings. 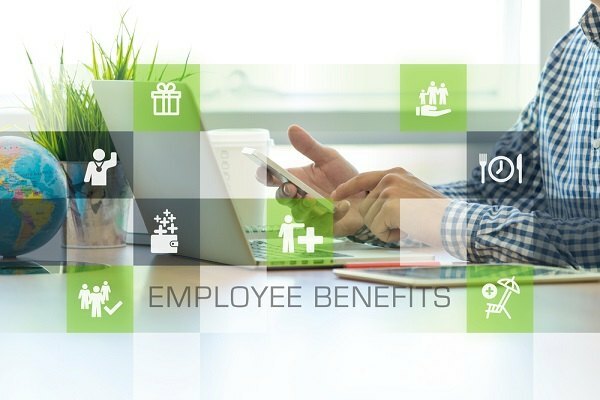 In tracking employer benefits offerings for compliance, the Affordable Care Act (ACA) did something unheard of in the past: it required employers to aggregate and better manage complex workforce data from unrelated payroll, benefits administration and HRIS systems. This data aggregation brought with it many new opportunities for employer groups: With new insights stemming from ACA compliance and reporting data, employers can gain a deeper understanding of how to use benefits and operational strategies to optimize their workforce. For the first time in U.S. history, up to five generations are employed in the same workplace, suggesting that there is a wide range of differences in what employees will expect and need from their employers in the years to come. The two youngest generations, millennials and Generation Z, together make up 40 percent of the employee population and their numbers are rising. As employees in these generations age and become a greater percentage of the workforce, they’ll put more pressure on benefits costs in three distinct ways: 1) Increased enrollment in employer plans, 2) choosing better benefits, and 3) opting for family plans. They will also challenge your company’s retention strategies, forcing the need to re-evaluate your health and employee benefits offerings to achieve the engagement and retention results you’re looking for. By integrating the same data sources used to comply and report on the ACA—HRIS, benefits and payroll—new insights can be gained. Analyses shared within the Health e(fx) 2018 Insights Report reveal some unique findings on the benefit preferences shown by different generations. Currently 35 percent of Gen Z and 77 percent of millennial employees are ACA eligible for benefits. Of those, only 26 percent of eligible Gen Z employees and 68 percent of millennials are enrolling in employer-sponsored coverage. There are multiple factors that could be impacting this lower enrollment. Due to their stage of life, these younger generation employees are less likely to face significant or chronic health challenges. Because some millennials and most Gen Z employees are still eligible to be covered under a parents’ health insurance plan, many are not enrolling in their own employer-sponsored benefits, yet. But in the next five years, nearly one in five employees enrolled in family health coverage will have a millennial or Gen Z dependent age out of parental coverage. Every health insurance plan is assigned a metal level—Bronze, Silver, Gold or Platinum—based on actuarial value (percent of covered medical costs that a plan will pay). Plans with a higher actuarial value (such as Gold and Platinum) pay a higher percent of medical costs, but their premium costs are also higher. 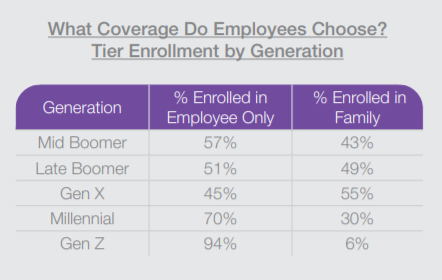 A higher percent of employees in these two younger generations select a Bronze-level plan (with the lowest actuarial value) than workers in other generations. 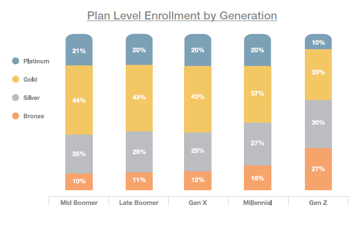 In fact, 27 percent of Gen Z and 16 percent of millennials are enrolled in a Bronze plan in comparison to 12 percent of Gen X or 10 percent of Mid Boomers. This means that currently, these younger employees are more likely to have lower premiums for their coverage. Both younger generations have lower enrollment in family tier coverage with only 30 percent of eligible millennials and 6 percent of Gen Z enrolled in family coverage versus 55 percent of Gen X. As the younger generations age, based on stage of life, more employees in these generations will opt for family coverage. Why do these factors matter? Because benefits impact retention – but only if your employees enroll to take advantage of those benefits. According to our analysis, the average tenure overall for employees who are not enrolled in health benefits is 3.1 years versus 6.7 years for those enrolled in employee-only coverage and 9.7 years for those enrolled in family coverage. On average, length of tenure also increases with better benefits—as the actuarial value of benefits increase, so does tenure. As these generations age, employers will have to revisit their benefits strategies to ensure they’re offering quality and affordable coverage to keep these generations invested in staying in one place – at your company. These younger employees are more likely than previous generations to change jobs in an attempt to achieve the wage and benefits that would enable them to live the lifestyle they desire. With the younger generations soon dominating the workforce, their increased enrollment and transition to better benefits and family coverage may impact your budget, and the longevity of your workforce. Michael Showalter is executive vice president of Health e(fx), the Minnesota-based ACA-compliance technology solutions company. 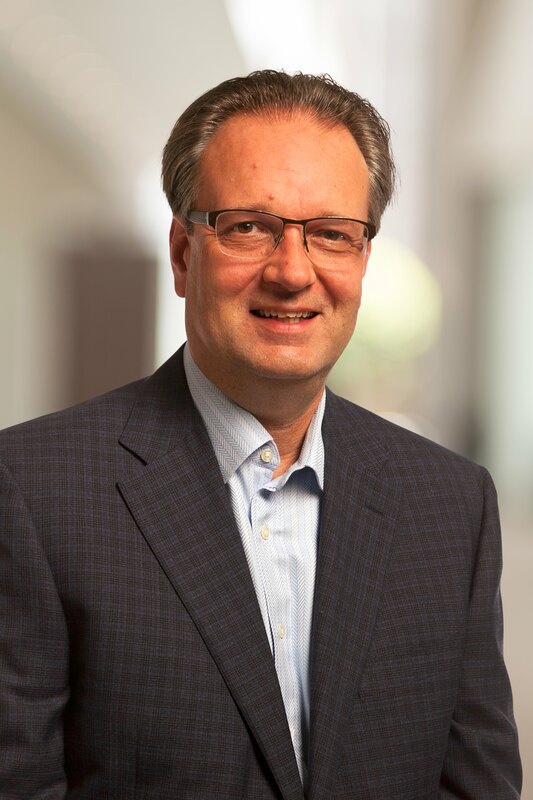 Before Health e(fx), he served in executive leadership roles at Prime Therapeutics, CIGNA Corporation and Definity Health. Michael can be reached at 1.888.963.9174. For more information about the research cited in this article, visit: http://info.healthefx.us/insights-report.